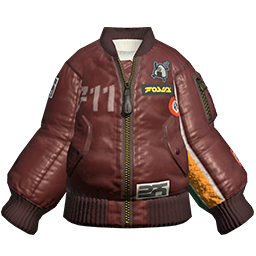 The Brown FA-11 Bomber is clothing in Splatoon 2. The Brown FA-11 Bomber is a reddish-brown, long-sleeved aviator jacket. It has faint white lettering on the right breast and logo patches on the left breast. The underside of the left sleeve is a bright orange. The Brown FA-11 Bomber comes with Bomb Defense Up DX as a main ability. As a 2-star item, the Brown FA-11 Bomber has two additional slots for secondary abilities. Since it is made by the Forge brand, it has a higher chance of rolling Special Power Up and a lower chance of rolling Ink Saver (Sub) to fill its secondary ability slots. A male Inkling on the right wearing the Brown FA-11 Bomber. Closeup of the Brown FA-11 Bomber.